I must admit I have been slow lately. I burned myself out because of the demands at work. I have yet to fully recover and I know it would take time for me to recharge. As the resort's occupancy rate is dropping, I am finally getting a little break from the high season madness. I was overly confident that everything would go smoothly as planned and that I would finish ahead of schedule. Little did I know that just one flaw would cost me a great deal of time and energy. Icing the cakes went smoothly. Working with fondant was a challenge. Imagine kneading 2 kilos of fondant, rolling it out to the required size, lifting the white icing and covering the cake with it. A piece of cake. Not so when the fondant you rolled out for so long and carefully placed on the cake cracks on the edge. And it was not just a small crack. They're huge, long ones. That's what happened to my fondant. I repeat the process five times but to no avail. I tried to salvage what I had by mixing it with a new fondant but it didn't work. It was tearing on the edges as soon as I lay it on top of the cake. I had to call my supplier to send me new ones but couldn't reach her. I looked at the clock and saw I had been working for 3 hours on just one cake already. I had more things to do. I worried if I couldn't get new fondant before noon, I wouldn't be able to finish all before sunset. I took a break and went to the canteen to have late breakfast. As I was contemplating, I remembered two containers with label that said white cake covering sitting in my fridge for months. Another supplier sent them by mistake and nobody cared to return them. I had no idea what it was but I remembered it was a white dough like stuff inside. I quickly finished my breakfast and ran back to the bakery and opened the container. I took a small piece, tasted it and was so relieved to find out it was fondant! I ran to the main kitchen to use the microwave to soften the fondant. I mixed the softened fondant with the cracky one, knead it together and that fixed the problem. Thank God. The wedding color was gold and red. I wrapped a gold ribbon around the base and placed fondant beads around it. 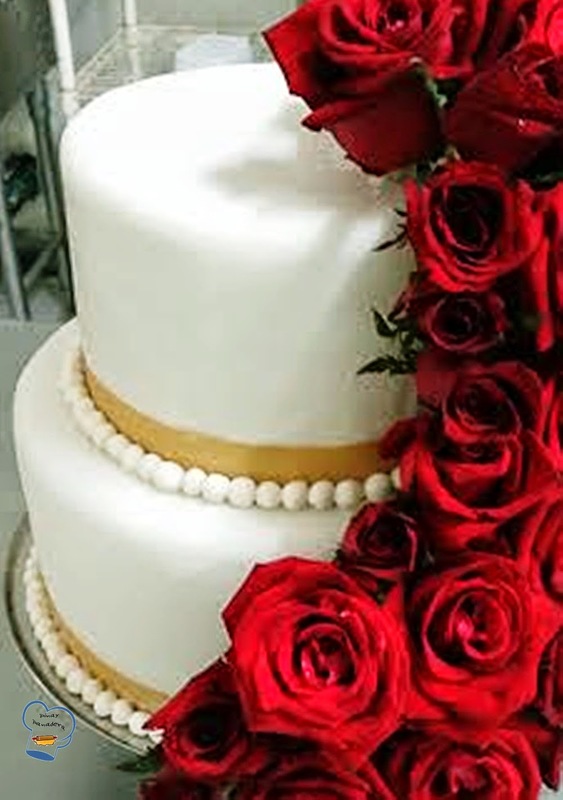 The cake was decorated with fresh red roses.